I don’t know which is more daunting. My first tri or my first race report…but here goes. Excited kids dispatched safely to Mairead and John, Dean and I head home to pack bags, bikes and car for our 5am start the following morning. I’ve googled a ‘tri stuff list’ and we tick off the numerous items required. This is complicated, but exciting. We arrive early and enthusiastic at 6am, only to learn we are in wave 4 and will not be starting till at least 9.30. Oh well, a chance to get set up and take in the atmosphere and check out all the other competitors. Don’t say you never do it – we all do! Get bikes out of the car and I decide now is the time to learn how to put the wheels on. I do, but smear my 795 hoodie with oil in the process, great. Next check the tyre pressure. Frank says 100 – 120. Then Dean catches me cleaning a smidgen of dirt off Joy’s bike with a baby wipe. Frank says that’ll save me 30 seconds Then I dither about whether I try the bike shoe thingy getting on and off the bike. Dean sensibly reminds me to do the simplest thing and get on with it. Then Dean, who doesn’t have a tri belt, tries to work out if he has to turn his shirt around back-to-front for run to display number on right side (! ), but luckily we are given two numbers. Transition set up is mad, I spend more time checking out my neighbours’ set up than my own. Its a whole new world! Despite the talc-in-socks look being in vogue we decide to scrap the socks and glad we did too. Then we realise we didn’t bring sandals or spare shoes to wear so from now on its easy to spot the newbies going around barefoot. Being in wave 4 was an advantage in the end as it was good to see how it all works and watching the tired bodies get out of the water was interesting. I can see how open water swimming is a better playing field. In the pool, all 12 people in each lane started on the same whistle so some hadn’t actually started their race till others in their lane had completed 50 metres. When it came to our start, Dean opted to lead his lane as a few of them all had the same predicted time. I’m sure James would have been proud as he did a great swim and having that start really helped. I made the mistake of being too diplomatic, only to have to swim breaststroke for first few lengths. Lesson learned. Otherwise, swim was grand, though looking forward to open water ones. Run to transition and onto the bike, I just had to slot on the helmet, shoes and tri belt and I was off but Dean had to put some clothes over his French vending machine swimmers, so I clawed a few seconds back on him there (not that we were competing or anything!). I absolutely LOVED the bike leg. Really concentrated on keeping cadence high and pulling legs up. Had a real ding-dong with number 331, passing eachother numerous times over the course of the 15km (I eventually pipped him on the run from dismount to transition). Dean and I pass by eachother on the bike leg out and back, words of genuine encouragement exchanged. 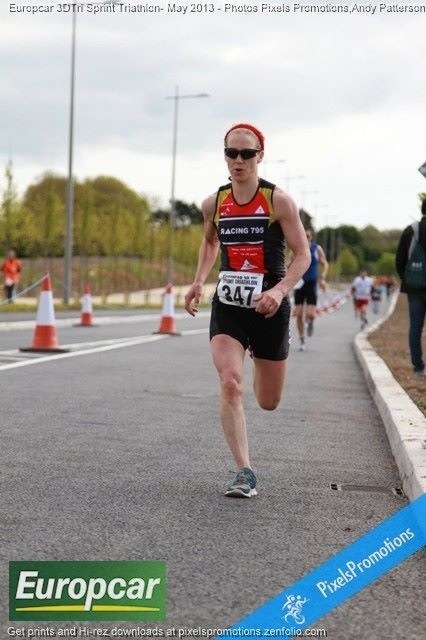 Into the runners and out of transition and….boom….energy gone, HR soaring, breathing laboured, legs like jelly. What the hell is this, I think. That is one crazy feeling and I admit I did not train for it or expect it in such high voltage! Forced myself to slow down after about 500 metres as I knew I was in trouble, just had to talk myself into regaining control and relaxing but concentrating on good form. After 2km I felt a little better and had finally found a rhythm. Then I heard foot steps and breathing behind me and, red rag to a bull, I wasn’t going to let them any nearer me if I could help it. It was like the grim reaper on my back for the rest of the race and it, weirdly, helped. Then, at about 500 to go, this long, lean, machine comes up alongside me and mutters something. I grunt and we both go for it, but he has the gas left in the tank that I don’t. As he looks back to make sure he has me, I actually don’t mind, as I’ve given it my all (Though afterwards he thanks me for doing the hard work!). As with the bike leg, Dean and I cross paths on the run. I can see that I am gaining on him but know he is too far ahead to catch him. But to be honest, it was a personal endeavor for both of us and I salute the MTB poster boy on his 52 second victory! But….ask us about our first tennis match back in 1998 and that is a different story…. Post race analysis with fellow competitors and then shower and hit the road for home, via lunch at Avoca in the sunshine. Nice. So, Orla…when your old gray and incontinent, you can pick up the pen and write novels..great report….